Sue Anna Miles, 77, of Hurley, MS, passed away on Saturday, January 12, 2019. Sue was born on July 9, 1941 in Fort Knox, KY to the late, John Bernard and Verimae Jones. Sue was a lifelong member of Hurley United Methodist Church. She enjoyed making jewelry and spending time with her grandchildren. 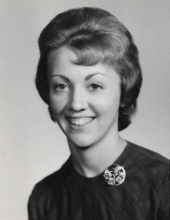 In addition to her parents, Sue was preceded in death by her sister, Joyce Goff. She is survived by her husband of 59 years, Fred Miles; sons, Tony (Darlene) Miles and Chris (Keesha) Miles; grandchildren, Makenzie Miles, Logan Miles, and Emily Miles; along with other family members, and friends. A graveside service will be held on Wednesday, January 16, 2019 at 3:00 p.m. at Magnolia Springs Cemetery in Hurley. To send flowers or a remembrance gift to the family of Sue Anna Miles, please visit our Tribute Store. "Email Address" would like to share the life celebration of Sue Anna Miles. Click on the "link" to go to share a favorite memory or leave a condolence message for the family.